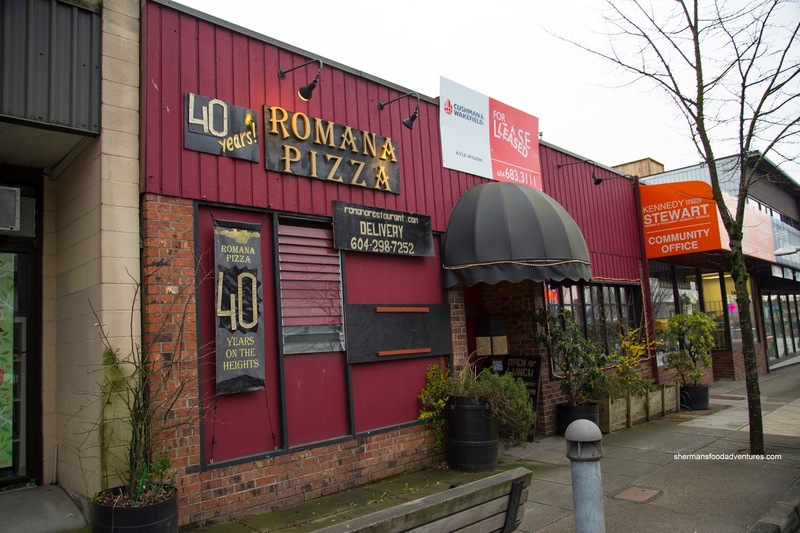 For a place that has been around for 41 years, it is a bit odd that I've never ate at Romana Pizza. It is especially curious that I've totally ignored the place even though I have lived in the neighbourhood for nearly 10 years. It took a visit from Aussie and family for me to actually go for a meal. Ironically, the guy who makes the pizza is retiring (yesterday was their last day). I guess we made it just in time! For those unfamiliar with the place, think along the lines of similar Greek-Italian restaurants such as Gigi's, Neighbours and Sunrise. I remember a time when Aussie would be able to down a whole large pizza in our University days. Hence, it came as no surprise when he ordered 2 large for his family of 4. But to get some greens, they started with Grandpa's Garden Salad first. 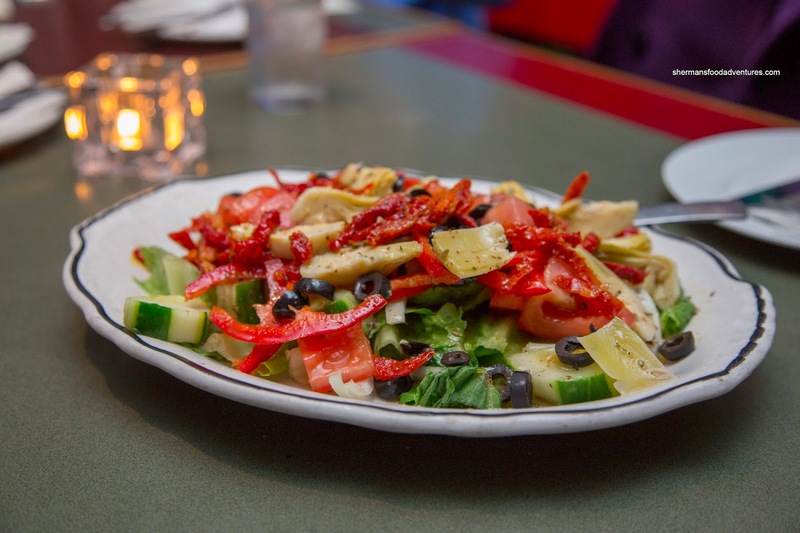 It was an assortment of cucumber, romaine, red peppers, olives, artichoke hearts and sundried tomato in a vinegary and zesty dressing. Everything was crisp while the olives and sundried tomatoes added extra saltiness and tang which meant less dressing would've been better. 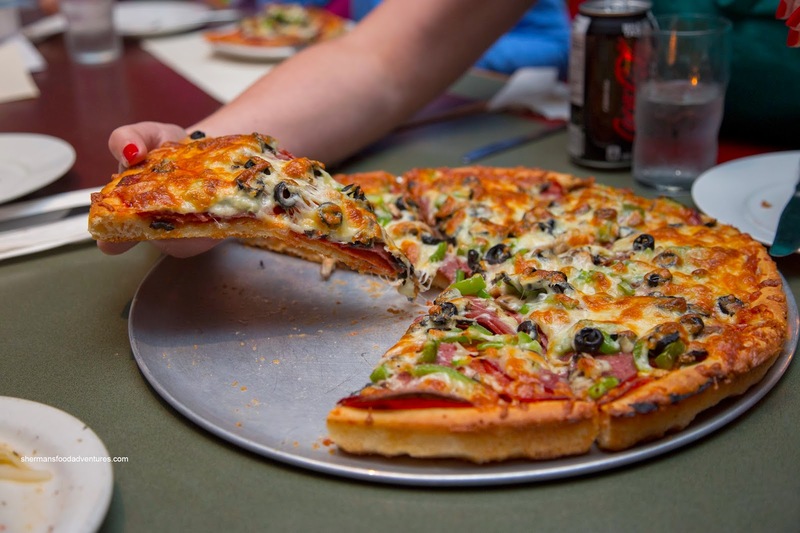 For their first pizza, they had the Mama's made with pepperoni, mushroom, salami, green pepper, olives and a whack load of cheese. For this type of pizza (ie. not Neapolitan or slice style), it was good since it was overloaded with toppings (especially the meat) with lots of cheese (which was not greasy) and on top of a crunchy while soft crust. They also had the Hawaiian and it was also packed with ingredients. 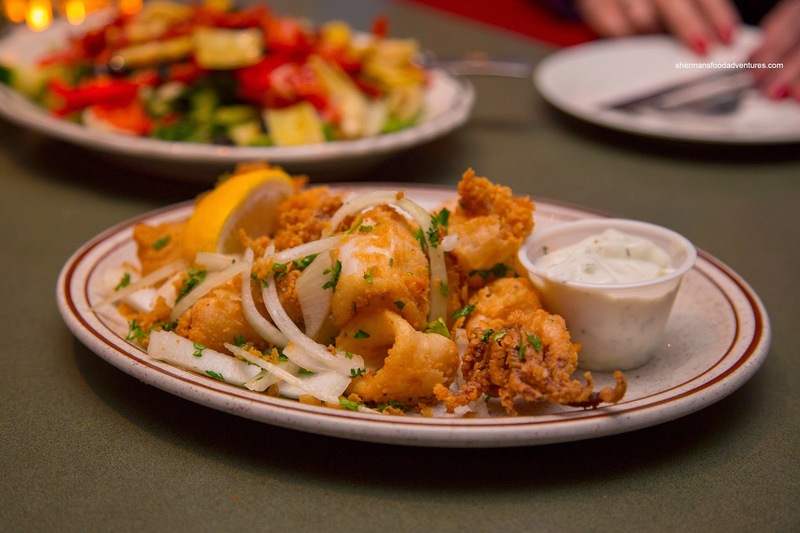 For myself, I got the Calamari to start. It arrived with larger than most pieces of squid which were tender while at the same time maintaining a chew. The crispy and light batter was good and not overly greasy, but due to the size of the some of the pieces, it didn't adhere properly. As for the side of Tzatziki, it was light with plenty of cucumber. I would've liked more impact though. 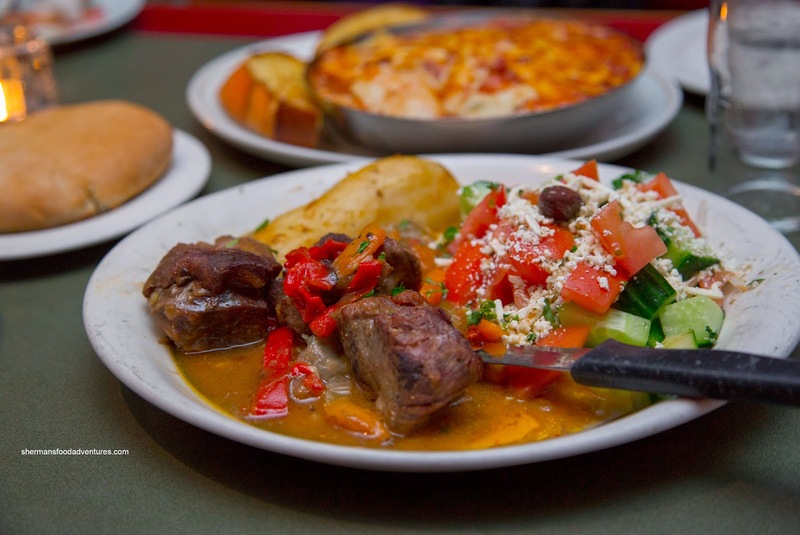 For my main, I went for the Kleftiko New Zealand Lamb Shoulder with potatoes and Greek salad. At first, I was concerned with the perceived small amount of lamb on the plate. However, as I ate, I realized it was more than enough (partly because there was no bones). The lamb was tender with a few dry spots. With only the addition of the roasting juices, the flavours were rich and natural tasting. It was on the saltier side, but it added the necessary flavour. 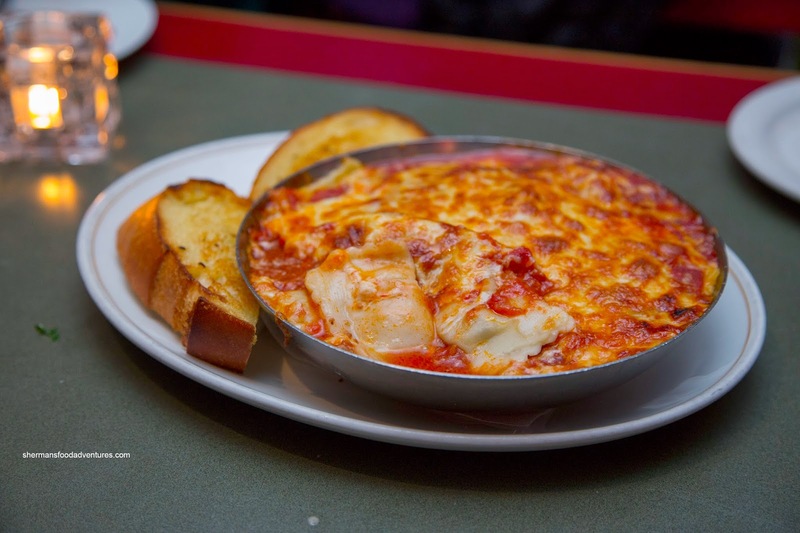 Viv ended up with the Baked Ravioli with Meat Sauce that came with 2 slices of garlic bread. This was a fairly large portion with soft ravioli in a somewhat mild meat sauce. Although it was pleasant enough to eat, she thought the sauce could've had more tang since everything was a bit one note. She did like the ample amount of nicely baked cheese on top though. In the end, we all agreed that the pizza was the highlight as it was good for its type. The other items were alright, yet a little pricey. So Romana as we know it served its last dinner service last night.